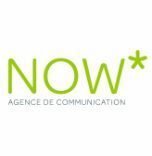 Set up in 1992, NOW* is a communication agency recognised by the ASSP (Association of Swiss advertising companies), located on the Biopôle site in Epalinges. With 10 passionate and motivated staff members, the agency is characterised by its creative, sustainable and responsible projects. With its 360º vision, it masters all the various means of communication, from print to digital, and offers a panel of customised services in order to enable its clients to choose and create the appropriate material, in line with their business strategy and within their budget. NOW* works, depending on the mandates, with a network of specialised and trusted partners. If you want your product or service to stand out and be noticed, it’s time to discover an agency that brings together the most experimented and the most unbridled talents to create the ideal communication mix that will single your brand out. The right messages on the right media, it’s no longer yesterday, it’s not yet tomorrow, it’s NOW*. • Excellent responsiveness, a high degree of flexibility and a huge dose of creativity. • The will to bring added value to the projects – the agency is a proper partner. • Three project managers who share their ideas, experiences and thoughts to optimise the quality of the follow-up. • A creative team of five different and complementary people who bring a broad array of skills, styles and talents. • An approach always based on sustainable development concepts, ethical and responsible projects. • A multimedia designer (a real geek! ).